There are two situations where I have to struggle to censor myself from shouting out (or typing out I suppose) expletives when writing a review. One is when a drink is insanely awful, the other when it's insanely great. Thankfully this is in the latter category. 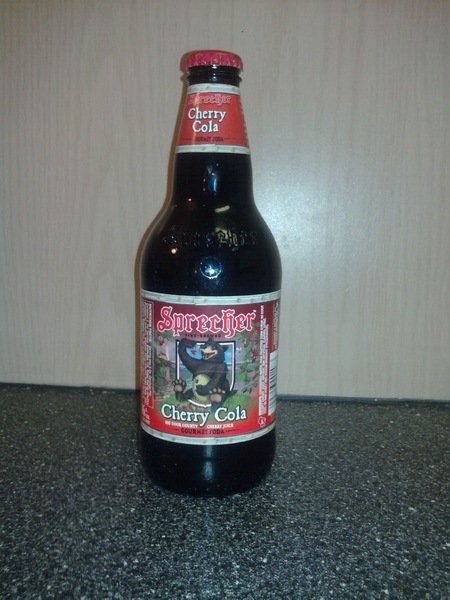 Sprecher Cherry Cola, or rather "Fire-Brewed" (it's in tiny print) Cherry Cola is amazing. Obtaining this was a tiny adventure in itself. First of all I got the tip about it from DW who found it in the grocery store I go to just about every other day. How could I have missed this? It's Sprecher, who has a great root beer, making a cherry cola? I had to have seen it! Well, it wasn't with the regular sodas. With the scoop, I went straight to the store next time I had a chance and checked it out. None to be found. My next attempt started poorly. I was in the regular soda aisle and still couldn't find it when I noticed a lost-looking employee with one in his hands. He couldn't find where it went and I couldn't find one to buy. I told him "that's exactly what I'm looking for!" I think he was more excited that he didn't have to keep looking for it than I was to have found it. Eventually I will have to look for it again because I don't see how I won't be able to pick up one of these on a regular basis. Here's a preview of what you're about to read: this is one of the greatest sodas I've had. This is absolutely delicious. As soon as I took a sniff I was sold. It wasn't just the scent of cherries, it was cherry cola. It smelled boldly of cherry cola. It's smooth, sweet, rich, creamy. This is absolutely the best cherry cola I have ever tasted. But... there has to be a negative, doesn't there? Yep. It's got HFCS in it. It's so good though, I honestly do not care. I know, shame on me. Let's look at the positives. First it's made with Wisconsin Door County cherry juice and Wisconsin raw honey. Good so far. It also mentions "the finest cola extract and a handful of selected spices cooked to perfection in our gas-fired brew kettles." That makes up for it's one downfall for me. This is so good I'm sitting here sniffing the empty bottle while I'm typing this out. Crazy? You try it. I don't know what's harder to believe, that after over 100 reviews, this is our first cherry cola or that a soda with HFCS is going into my top 5?